This sculpture stands in the Trädgårdsförening park. It was made by Pål Svensson and is called Det hemlighetsfulla porten, which could be translated as “The mysterious doorway”. The door I photographed through the sculpture is on the corner of Lilla Kungsgatan and Stora Nygatan. I originally published this photograph at GBG365 on 5th December 2013, just a day after taking it. I’d had my eye on a photo of this subject for a while, but this was the first time everything came together. 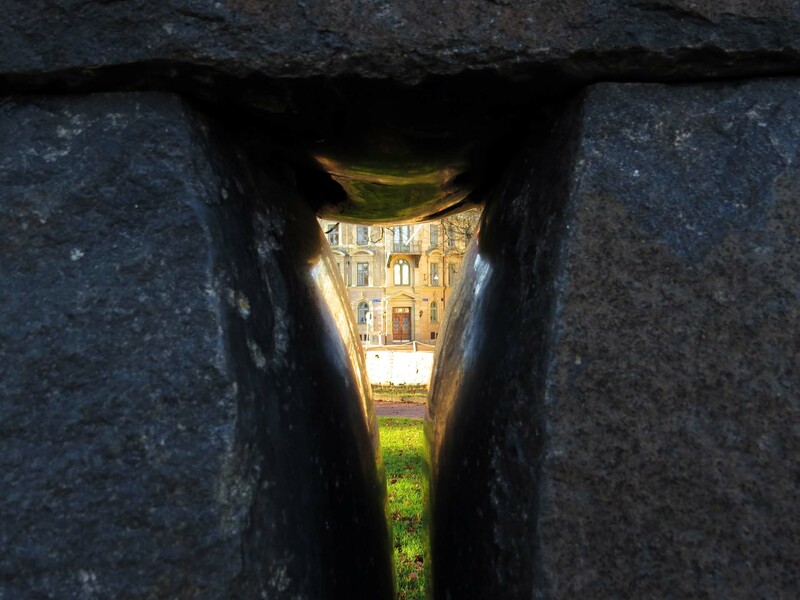 The light on the door across the canal causing reflections on the polished stone of the sculpture. The Mysterious Doorway stands on a small hill in the park and you can look through it in both directions. However, only in this direction does it frame an actual doorway. I can’t believe this is happenstance.